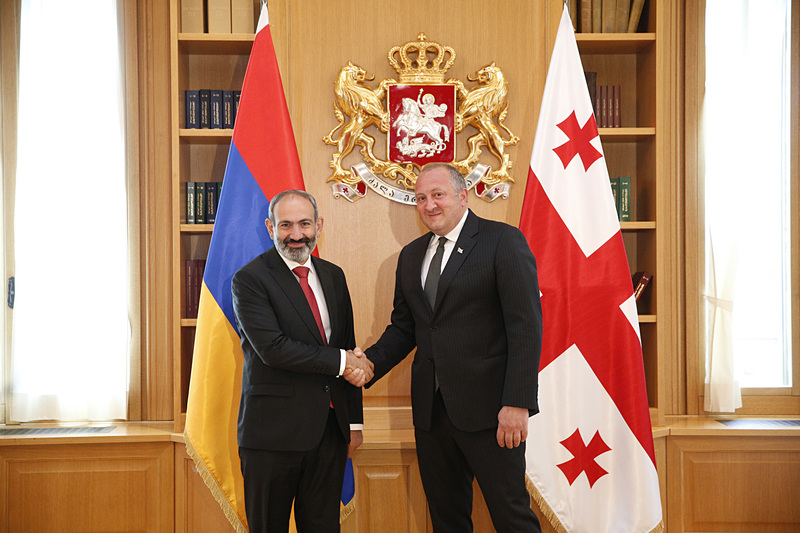 Prime Minister Nikol Pashinyan held private talks with Georgian President Giorgi Margvelashvili in the frame of his official visit to Georgia. Greeting the Prime Minister of the Republic of Armenia, Giorgi Margvelashvili appreciated the results of the meeting between the governments of the two countries and went on to note that the issues and initiatives discussed will be a stimulus for the further development and strengthening of bilateral relations. “I am glad to meet with the Prime Minister of Armenia. I hope your visit will give fresh impetus to Armenian-Georgian relations which have a centuries-old history,” the Georgian President said. Nikol Pashinyan said he was glad to meet Presodent Margvelashvili within the framework of his official visit to Georgia and discuss the prospects of bilateral relations. “I am glad that my visit to Georgia comes amid drastic democratic developments in our country, and I am also convinced that democracy is of vital importance to our countries. Our peoples’ credo is based on love and solidarity in bilateral relations, and we will spare no effort to give them a new impetus,” Nikol Pashinyan said, confident that during the present meeting they would be able to outline new opportunities for the development of interstate cooperation. Noting that several large-scale events will be held in Armenia later this year, the Premier said he looked forward to having another opportunity to meet Giorgi Margvelashvili in the framework of the 17th Francophone Summit to be held in Yerevan this fall. Nikol Pashinyan and Giorgi Margvelashvili discussed a number of issues of Armenian-Georgian relations.